I've Got Laurie R. King Covered! If it ever comes up in bookish conversation, I will normally say that I'm not a cover junkie. That I don't care what the outside of the book looks like, it's the inside that counts. Although it's true that the words inside a book count for worlds more than the artwork on its cover, I'm still a bit of a liar, aren't I? Any book lover can tell you that the very first thing they see when they're browsing is the book cover. After all, the publishers paid for that artwork to catch our eye and entice us to buy, buy, buy. Once I was finally honest with myself and admitted that the cover is the first thing I see, that led me to another thought about those pesky duplicates. What if-- like me-- you read a lot of books published outside the USA? Since English is the only language I read with complete comfort, that means that I'm very familiar with the names of publishing houses in the UK. Quite a few of my favorite authors are published both in the US and the UK, and that has explained several of my duplicate copies over the years. Exact same book, but different countries, different publishing houses, different book covers. See why I've trained myself to shop with a list? This same book/different cover has led me to a favorite little game however. A game of Which Cover Is the Best: the American or the British? 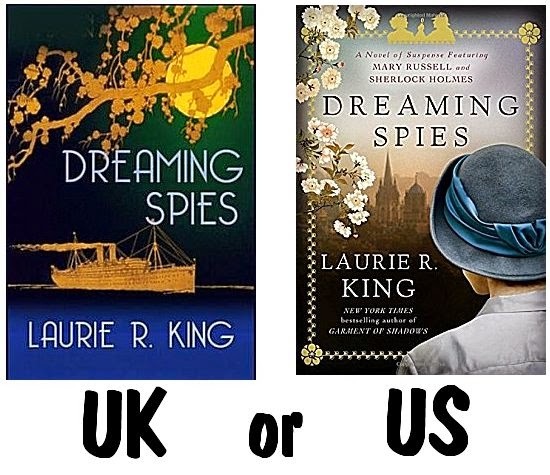 This week I thought I would have you join me in the game with Laurie R. King's recently released Mary Russell and Sherlock Holmes mystery, Dreaming Spies. On the left you can see the UK edition of Dreaming Spies. On the right is the US edition. The UK cover ties in with Mary and Sherlock's travels to Japan with the ship and the Japanese-style branch of blossoms and the moon. But for some reason, it falls a bit flat for me. Perhaps if I could see it in the flesh and hold it and catch the glimmer of the gold ship and blossoms, I'd warm to it more. The US edition also has ties to Japan with the stylized border and the flowers. It also brings in Oxford University, renowned for its "dreaming spires." If the cover stopped with the border and the spires, I might choose it, but there's a deal breaker on that cover. What is it? That woman in a hat looking toward Oxford. What can I say? I'm sick to death of seeing the back of a woman's head on a book cover. I figure marketing thinks all the women who see this are going to put themselves in the place of the cover girl. That's why you can't see her face. If you do see her face, you won't be as willing to put yourself in the story. If only that worked for me. But it doesn't. I hate wearing hats. There are only two weather conditions in which I'll even consider wearing one: either to keep the desert sun from frying my brain or to keep sub-zero temperatures from freezing my ears off my head. Besides, there's just something downright rude about all these women standing around with their backs to me. So there you have my dilemma. I honestly don't know which cover I'd choose! Do you? Which cover appeals to you? The UK edition or the US edition? Inquiring minds would love to know! OK, I am an unrepentant cover junkie. I love covers. And it is a definite problem at libraries with all those books shelved. When I worked as a library page, I decided to do some faceout of the books. If there was room on a shelf, I would stand one book up so the patrons could see the cover. And do you know, those books disappeared rapidly. The faceouts do make sense because I think most people are intimidated by the sight of shelf after shelf of words on spines. Something else must catch their eye, and that's the artwork on the cover. I prefer the U.S. cover. I agree with Kay about the colors. I generally chose books by authors or reviews. I am using my Kindles more and more so I see the cover less than if I am holding a hard copy of a book. I do kind of miss that when reading a Kindle. One is in black and white. The other is color but I don't go back to the beginning after I start reading to look at the cover. The hat is ok with me. It tells me it is probably a historical mystery The back of the head is fine too. The cover has a feminine feel. I have noticed quite a few thriller covers where the boogie man is coming out of vegetation or something else as just a black shadow of a man's body. It looks quite menacing. I have also notice the fleeing woman looking over her shoulder at the person chasing her. I think in both instances, that they are overdoing those images on the covers. You bring up a couple of very good points, Lynn. (1) If eBooks were ever to be the only way to read books, cover art would vanish, wouldn't it? You're right-- once you get into a book on your Kindle, you really don't see the cover again. (2) You seem to be quite prescient with your talk of shadows and fleeing women. You'll see why net week! If I'd been browsing, I'd have at least picked up the UK cover, but I would have passed by the US cover entirely. Again, it's the woman's head. I love wearing hats and I lovethe time period implied by the one on this cover. BUT I've just seen too man books using this motif, and many of them are romance or "soft" women's lit - both of which are definite NOs on my reading list. Debbie, I agree. That back-of-the-head conceit usually indicates romance or women's fiction titles, both of which I do not care for. I knew there was another reason why I didn't care for it-- thanks for your comment! "I prefer the UK version. I am accessing your blog through AOL and the colors are very appealing on my screen. Also the design is crisp and clear. As for the US version - here we go again with women’s faces being obscured. Usually they face forward and the face is cut off from the top. On this cover the whole face is gone and we are presented with the back of the head. Yikes." Well, I am in the minority here. I like the US cover and I like it because of the hat on the head. Not sure why exactly, maybe as Lynn T. said, it says, historical, feminine and soft. But I understand your feelings. Sometimes, certain images just don't do it for us. I am recently turned off by just the title on the cover. "shrug"
I like the US cover better. I like the colors and the setting. I'm among those annoyed by the woman with her back to the viewer. But there are reasons why I would actually rather not see her face, one of them being that we never imagine her looking the same way as anyone else does. There was a series that I really loved, but one book cover had artwork of the character's faces on it, and none of them looked the way I'd imagined them. It was something of a turn-off. I think the cover would have been just as good without the woman in the hat, personally. I agree, Pepper. I think the cover would've been just as good without the woman. You bring up an excellent point. 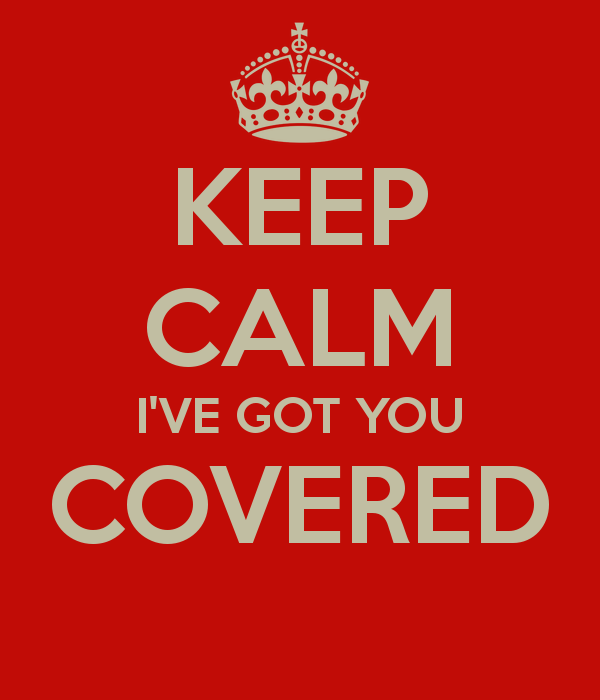 (And since I'm not a cover junkie, I need all the help I can get!) I never thought of the woman representing a character in the book, only that she represented the reader. If the woman represents a character in the book, it's better not to see her face. In the case of Dreaming Spies, I know I don't want anyone to tell me what Mary Russell looks like! I like the UK cover better. I might have liked the US cover, but without the woman or her hat. I'm partial to the fonts in the UK cover, for one thing. But I never choose books based on their covers, but based on reviews, blog posts or comments or friends' recommendations. I don't choose a book by its cover either, Kathy, but covers can certainly generate some interesting conversation! If I'm not mistaken, the UK cover font is appropriate to the time period of the book. Also, Crime Segments has a box with a quote in it saying, "Keep calm! It's only fiction!" I really like that, too.